A great number of Rangers fans quite simply weren’t born in 1989, the majority in fact. Yours truly remembers the season well – the Berlin Wall came down, but in Glasgow the signing of Maurice Johnston was a lot bigger. Seismic in fact. However, Rangers’ season that year had a truly diabolical start – two losses (St Mirren and Hibs), one draw (Celtic) and it wasn’t till the fourth match a victory finally arrived. Older Bears will remember that opener at Ibrox well, St Mirren’s Kenny McDowall (remember him) injuring Chris Woods, bundling the ball over the line before taking all two points, where Graeme Souness’ Rangers then travelled to Easter Road and Mickey Weir smacked in an edge of the box grass cutter to make it 2-0 and Rangers were in dire straits. The third match, a trip to Parkhead, had a great deal riding on it – Celtic top, Rangers rock bottom (one off the only times in history this has ever happened), and Celtic the only side with a hundred percent record. The big moment in that one saw Terry Butcher rise like a colossus from a Trevor Steven corner and head home. The celebration was huge and Rangers finally got going with a well-earned point. Why the history lesson? Because as Chris Sutton has reminded us, the loss at Parkhead makes this presently the worst start to a Rangers season since that fateful one in ’89, which of course, still led to Rangers winning the league for 2IAR. It’s hard to sum up where Rangers are right now. We still remain hopeful of our overall season prospects. About 90% of Gerrard’s management has been excellent so far and we must remain calm with that in perspective before making any rash conclusions about what the result at Parkhead meant. We’ve made the UEL group stage, not lost a match till now, and still only conceded barely a handful of goals this entire campaign. However, what is abundantly clear is just how agonisingly poor this Rangers performance actually was for its own part. Celtic were decent, nothing great, but Rangers simply didn’t show up. Didn’t battle. Didn’t do themselves justice on any level and if we accept the point that the buck stops with the manager and they do his bidding to his letter, then we’re at a loss as to the gameplan, tactics, formation, half time team talk, and absolute palpable lack of energy. We know there was a long trip back from Russia, and we accept that may well have had a bearing on things, while Celtic didn’t have to budge an inch from their Thursday win at the same place over their UEL opponent. However, Gerrard’s management was at best confusing and at worst plain wrong. And we are entitled to call that however much we’ve admired him up till now – most fans appear to be of the same opinion that the performance was flat as a pancake and SG got pretty much the whole match incorrect. There’s a caveat. Celtic do raise their game against Rangers – and Brendan Rodgers has been doing this gig a hell of a lot longer than his Ibrox counterpart. We also cannot and will not forget the otherwise excellent start Gerrard has made to his Ibrox career. However, at this early stage, one win in four matches in the SPL is truly diabolical – even though we were clearly the better team at Pittodrie, we probably got what we deserved at Fir Park and certainly deserved no more at Parkhead. It’s a strange domestic mixed bag – a fine result and performance at high-flying Killie can’t be forgotten either in the league cup, so it’s very difficult to sum things up. Did Rangers take a small backwards step this weekend? It’s possible. We await 4-defeat Dundee in two weeks to make any kind of assessment as to where Gerrard’s men are. Hopefully we’ll have licked our wounds and assessed the errors of Parkhead while equally hopefully welcoming back badly missed Lassana Coulibaly. We also, however, must offer a word on Gerrard’s nonsense post-match interview. To suggest Rangers were the better team in the second half while whining over the Jack incident (never a foul, sorry) is not what we expect. We expect him to call it as it is and not play to the galleries. He has called it fair and talked good talk up till now, we do not want to be played for fools. He’s learning, and he’s still doing better than expected, but this was not a good day at the office for either the players or the manager and hopefully everyone will learn quickly from it. Gerrard may be in-experienced, but surely, that's what Gary McAllistair is there for. Also, I don't know about you, but when I was 21, I could play football all day, not just for ninety minutes and be recovered fully after a day. But these players were all ruined, with tiredness?? Not buying that. They're young men, in their prime. They were just god awful. Lafferty the saviour, was poor, so was Morelos. No creativity going forward, no bravery. Of course, we have to give them time. But if we're still making the same mistakes by Christmas, I won't be so forgiving. Patience is all well and good, but there is definitely cause for concern, here. Joe90, fair point. But to really hammer it home, you could list the professional teams you played for. I have known people in England and Scotland who were professional footballers, with rebuilt knees after accidents. Their knees were as good as yours or mine, but they will never play football at that level again. It is a different level. Did you honestly run 10-12Km in 90 minutes when you were playing. I didn't, I was never anywhere near that level. Fair point, well made. I shouldn't comment on here after a loss to Celtic. Poisons my whole week. C'tc put us back in our box yesterday, no question, but the lid is far from closed. Rangers will continue to improve where C'tc cannot improve on yesterdays performance, especially 1st half. They were a lot better than decent as you've suggested but that's as good as it gets for them. Roll on 29th December, it'll be a different game altogether and hopefully a different outcome. Good article IN. All this blaming the ref and whining about (non) fouls is getting unbearable. SG forgot to mention that Greegsy kicked out and should have been off. The resultant penalty would, more than likely,have put Celtic 1 up. the ills on show. Look a little closer, try not to be too biased and you will see that, on the whole, it balances itself out. Mind you, that Christie dive was shocking. He didn't forget to mention it, he admitted that Greegs should have gone. Doesn't change the fact the goal came from a foul. They say these thiongs even out over a season, let's see. 2 dropped points against Sheep won't be returned because Morelos shouldn't have been sent off. A lot of those new players it was their first OF and the squads only been together 2-3 months. Yes they were guilty of showing them too much respect first half, some players had under performed after their Euro heroics ( remember that 9 men ). Steven Gerrard said there will be some highs and some lows along the way that’s a given. It’s never good to lose to that rabble ever but it’s what counts come the end of the season that matters.. Funny same thing was said of Souness too and we all know how that story ended.. If energy levels were down because of the long trip, we should have rotated more. Brought McCrorie in, rested the players whose energy was down. But it has happened. SG needs to learn from that and move forward. Diabolical? Really? We were dealt a severe blow with our fixture list for the first 4 league matches. Losing to Ceptic and drawing at Pittodrie and Fir Park are results that could be expected and are results that better Rangers teams than this one have had. Had they been spread across the first 10 fixtures I dont think you would be calling them diabolical results. Our next 5 league matches are home to Dundee, St Johnstone and Hearts and away to Livingston and Hamilton. I would expect maximum 15 points from these matches and that would mean 20 points from 27 which I would call a decent start. We would also be at least 3 points closer to Hearts and no worse than 4 behind Ceptic. The second quarter would then give us home games against Ceptic, Motherwell and Aberdeen and a chance to turn around all those "bad" results. Last season was a disaster and if you had said you would be in the Europa league groups, unbeaten in 12 games this season l would've laughed at you, yesterday hurt like hell, as it always does getting beat off the scum, but we have brought in a few players who are yet to start, Coulibaly coming back,some supporters calling for SG's head is just crazy, l would've bit your hand off to be where we are just now last season, and still believe we have a right good chance of winning the league this season, the ambulance chasers will drop a good few points so let us all get back behind the team and as Big Marv says, "keep believing"
A little perspective guys, look where we were and where we are now. For sure yesterday SG got his tactics wrong and perhaps even the team line up. He is new to this and will learn from these mistakes. For people to come on and say that having a 6000 mile trip on Thursday is an excuse as these guys are fit is nonsense,even the best teams in the world are affected by this. Its not that the players are not fit its how the measure against players who have not had that round trip and a 90 minute game with a 2 man disadvantage. It is these small margins that determine games, one player in the moment a half a yard quicker or a nano second ahead in thought.On June 1st if we were told we would be through to the Europa league group stages, ok trail Ceptic by 4 points with 14 or is it 15 new players still growing together most of us would have been delighted. We come a long way in such a short time and I am delighted in the strides we are making. If we keep improving as we have done I still believe the title could still be ours. We very rarely win there, so its not the end of the world. It's more concerning that Ejaria never got replaced at halftime, and I@m astonished that we never made a substitute until 81/82 mins. Hopefully lessons will be learned, and as you said, they weren't up to much either. Celtic deserved to win and it could have been 2 or 3 nil, however...if we had scored 1 goal we would be doing handstands right now. Great acquisitions, qualified for Euro group stage, undefeated in 13 games...new team and manager off to an unbelievable start. The big picture is that we were one goal away from that yesterday. It was a flat, disappointing performance, but we’re so far ahead of where we had any right to hope for only a couple of months ago. As much as yesterday hurt I think calling for SG to go is ridiculous. The euro run can't be faulted so far. Yeah we've dropped more points in the league than we would have liked but when you consider the dons and motherwell games we were minutes (seconds) from potentially having full points from the first three games. Fine margins. It's a long season and there is so much more football to play. I trust in SG and believe that he will learn from yesterday and play differently in the next one. If you look at the difference from shkupi games where I thought we didn't exactly set the world on fire, this team are growing in their understanding of each other and experience of the game. 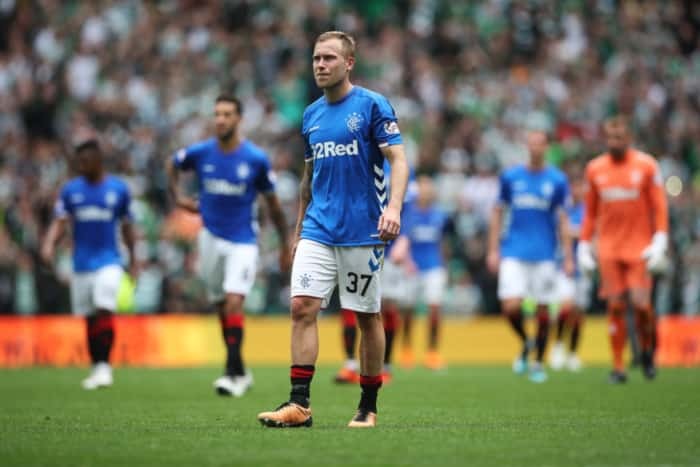 They are a relatively young side who maybe come from or played for top sides but they are relatively inexperienced when it comes to European football and also old firm games which even better players in the past have found themselves bewildered and lost. I think tiredness and the occasion getting the better of them did come into it yesterday and hopefully next time they will realise you can't switch off for a second in these fixtures. I trust in SG to do us proud over the course of the season and I believe yesterday was a learning curve for him. He doesn't strike me as someone who makes the same mistakes time after time and I personally think the results in last years old firms were at the back of his mind and not wanting to go gung ho and get exposed at the back was hopefully the reason we sat back so much. Celtic are beatable as hearts have shown. We are still progressing as a team and I beehive we are going in the right direction despite yesterday. The one thing I'm taking solace in is that despite us not showing up it was still only one nil (yeah could have been more) but even the great Walter didn't always get results 100% of the time and I can remember a time we used to complain about his tactics. He certainly lost a few old firms that I recall as well. We need to support the team when they are losing as well as winning and I still think this team that sg has something about them that we've not seen at ibrox for a long time. I think we need to see where we are this time next year as this team isn't the finished article. There will be other players to come in and I think being to Europe was a top priority to help attract and fund new players. I also think coulibaly could have made a massive difference yesterday and we could do with another creative force in centre mid. SG bottled it. They were very beatable. I cannot believe his game plan. I thought the idea was to be aggressive not allowing teams to dominate us. Last week Motherwell bullied us AGAIN!and the sight of Brown poncing about was hard to stomach. I love SG but begin to wonder if this is just a pet project. Don't think he bottled it. Think he made a call and got it wrong. If he felt we were too tired, should have swapped some fresh legs in. If he thought sitting back was the way to beat them, he was wrong and I hope he now gets that. excuse the pun, but if i were RANGERS manager having watched his arrogance and disrespect towards our great club i would make it my priority to wipe that smirk of his face and put him and his sidekick griffiths firmly in their place. we win the league and he's finished. RANGERS captains would have more class and respect, our club DEMANDS it. Any negatvity towards gerrard is exactly what (they) want to hear, don't be fooled by the result or their arrogance. they fear what gerrard might do despite mocking it.we'll be the judge at the busness end of the season, f**k what they think. they cannae handle the fact a legend would sign for THE FAMOUS. they will stop at nothing to acheive 3IAR and i mean nothing. UNITED WE STAND DIVIDED WE FALL.